Japanese Prime Minister Shinzo Abe and his visiting Laotian counterpart Thongsing Thammavong elevated their relationship to a strategic partnership following talks at Abe’s official residence in Tokyo on March 6. The inking of the strategic partnership comes as the two countries are commemorating the 60th anniversary of their diplomatic ties this year. It is an elevation from the “comprehensive partnership” that was signed in 2010. The strategic partnership builds on several key existing strands of the bilateral relationship. Economically, as of last year Japan was Laos’ sixth-largest export market and the largest provider of official development assistance, and Japanese investment and business interest in Laos has increased recently. More attention has also been devoted to the security dimension of the relationship on issues ranging from humanitarian assistance and disaster relief (HADR) to counterterrorism, with the establishment of a bilateral security dialogue in 2014. But the burgeoning partnership should also be seen as a component of Japan’s broader engagement with Southeast Asia under Abe, which I have written about extensively (see for instance, here and here). This is particularly important because Laos is chairing the Association of Southeast Asian Nations (ASEAN) in 2016. Substantively, the joint statement issued by the two sides stipulates that the strategic partnership will focus on cooperation in five areas: political-security; economic; trade and investment; people-to-people and cultural exchange; and cooperation on regional and international issues. Some specifics measures were also stated under each of these areas. In the security dimension there was mention of the acceptance of Lao students in the National Defense Academy of Japan as well as HADR cooperation as co-chairs of the Experts’ Working Group on that subject in the ASEAN Defense Ministers’ Meeting Plus (ADMM-Plus). 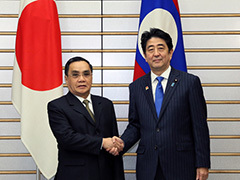 The economic and trade and investment areas had references to the Mekong sub-region as well as local industry development and private sector collaboration, while the people-to-people and cultural exchange section took note of some significant developments including a visa exemption for Laotians traveling to Japan, which is scheduled to start next month. Of course, the risk of strategic partnerships is always that actual collaboration lags far behind the ambitious goals proclaimed in the joint statements. Yet several ongoing endeavors or upcoming events give Japan and Laos opportunities to further strengthen cooperation in several of these areas, including their co-chairmanship on HADR for the ADMM-Plus, the summit between Japan and five Mekong countries in July and Laos’ chairmanship of ASEAN next year.